This article is about the one-time comic character. For the Globetrotter, see "Sweet" Clyde Dixon. 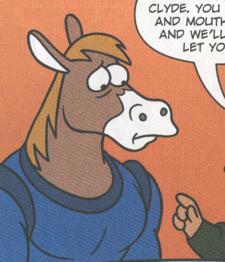 Clyde is a horse-like former employee of Planet Express. He was fired from his position for failing an annual physical examination due to a case of hoof and mouth disease. He also appears to be a racer, as Bender had placed a bet on him. This page was last edited on 24 December 2014, at 21:46.